Tawang is a quirky little town which is thankfully still offbeat. It is not a typical tourist destination, nothing to shop for, no top 10 things to do or even top 10 places to see. If you arm yourself with a strict itinerary you might miss the point and this beautiful place too and end up feeling disappointed. But it’s a beautiful town to let your hair down and explore leisurely. Most places around Tawang, have road access and Borders Road Organization (BRO) have done a good job in keeping them motorable through the year and like their boards say, “Yes Bro we are proud of you’. Tawang is believed to have derived its name from the Grandiose Tawang Monastery perched on the edge of the ridge running along the western part of Tawang township. ‘Ta’ means Horse and ‘Wang’ means Chosen. As the legend goes the site of the present Monastery is believed to have been chosen by a horse owned by Merag Lama Lodre Gyatso who was on a search for an appropriate place to establish a Monastery but was unable to locate any appropriate site. So he finally decided to sit on prayer for guidance of divine power. As he opened his eyes after prayer, he found his horse missing. So, wearily he went out searching for his horse and found it on the top of hill known as Tana Mandekhang where once stood the palace of King Kala Wangpo. Believing it to be a good omen, Mera lama Lodre Gyatso decided to initiate work for building of the monastery with the help of the people. The Monastery thus was founded by Mera Lama Lodre Gyatso in late 1681. However, there is also another belief of derivation on the name ‘Tawang’. The great treasure revealer, Terton Pemalingpa gave initiations such as Tamdin and Ka-gyad and hence the place came to be known as Tawang. ‘Ta’ an abbreviation of Tamdin; ‘Wang’ means Initiation. If you are not in a hurry to finish Tawang in a day, you can take a walk around to reach most of the places. At 10000 ft you will obviously encounter many scenic views of the mountains and valleys around and even some sporadic falls. If that is not an option, you can hire taxi from the Taxi stands in the centre of the town. Rates are negotiable, but since its a hill town its not really cheap. Tawang Monastery is the second largest in Asia and the largest in this area controlling 17 Gompas or monasteries in the region. 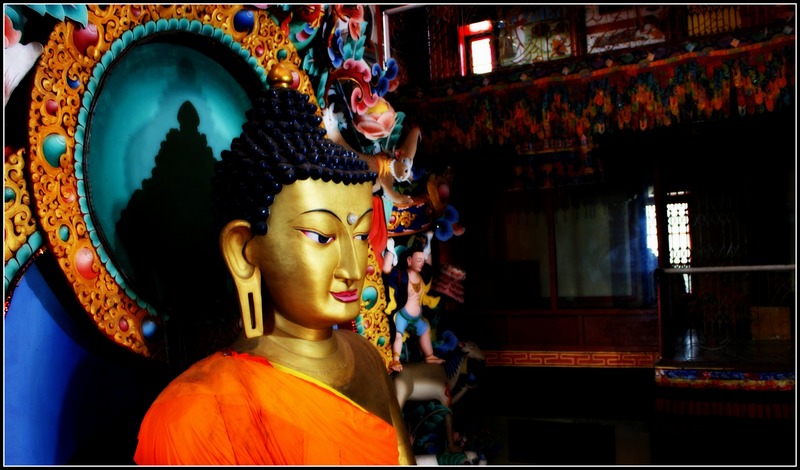 It houses the huge 28 ft Golden Buddha, the pride of tawang and has long been its poster boy. The monastery also houses a museum with artifacts of the yester years, rare inscribes and a picture display of events and dignitaries in the monastery. The gompa also houses a big library with an impressive collection of ancient books and manuscripts. Tawang is dotted with a number of gompas and a number of them have the primary deity has their various other Gods and not just the Buddha.The impressive madhubani paintings that adorned the walls and scrolls had more storied and interpretations that it was possible for me to interpret or understand from the briefing I got. But it definitely seemed interesting, with many gods closely resembling their hundu counterparts like the elephant head God, the god with the third eye etc. Another significant even that had happened in tawang was the Indo-China war of 1962 when China had occupied this territory. China still stakes its claim over Tawang and calls it as the disputed territory and insists on providing travel papers to the residents of Aruncahal rather than the conventional Visa system. The history of the Indo China War and the stories of bravery displayed by the Indian army during the war are captured in two places – The War memorial and the Jaswant Garh. Jaswant singh’s bravery of holding the Chinese army at bay for more than 72 hours with a very small battalion is a story that the localities and the army men take great pride in narrating. He was posthumously awarded Param Vir Chakra by the Indian Govt and the photos of this award event as well are featured in the War memorial. War memorial also houses a souvenir shop for the tourists. Army units and Civilians alike stop by Jaswant Grah to pay their respects to this great man and truly believe that his spirit continues to protect this area from that of the invaders. Tawang has a craft centre is a place where crafts men weave cloth and artists make monpa masks in a traditional way. This is one of the very places in India where authentic and traditional Tibetan crafts are made and can be bought. If you are looking for a souvenir from the trip, this will probably be your best bet to get something that’s unique and local. April to October is the best time to visit Tawang when the weather is mild and pleasant. Summer season starts from March and ends in June. Temperature ranges from 5- 22 degrees Celsius. Hottest month of the year is usually June. Tawang gets rainfall between July to October. December, January and February constitute winter season and is the best to catch some snow although it may be really cold around then. Temperatures range from a minimum of -2 degrees Celsius and can go up to a maximum of around 5 degrees Celsius during this time. Commuting in Tawang at the time of snow is not for the light hearted. Most adventurous tourists get rescued by the Indian Army when they get stranded in roads and the commute can be much longer than the usual 12 – 14 hours it takes from Tezpur in takes during the normal times. Roads with no snow can be several times more riskier and are a strict no no unless you are experienced driving is such conditions. Indian army battalions and their huge supplies truck are a un missable sight on the road and are as always very friendly and helpful. It is very much possible to find accommodation in Tawang at short notice. However since the town shuts early, it may make sense to book prior thereby letting the hotel know to expect you. Tawang houses a Circuit house, which is run by the government and is open for public to stay when there are no visiting dignitaries. You may also try booking in the smaller guest houses or home stays which provide a more authentic feel of Tawang. 1) Being part of North East and following IST, Tawang rises and shuts early. Even dinners are finished earlier than 7 PM and you might be restricted to watching TV in your hotel rooms for much of the night. That’s why it may be more important to stay in home stay here, which will save you from being stuck to the idiot box in a beautiful place. 2) Visiting Tawang requires a inner line permit from the Govt. of Arunchal Pradesh for Indian Citizens and a Protected Area Permit (PAP) for the foreigners in the offices in New Delhi, Kolkata, Guwahati, Shillong, Dibrugarh, Tezpur, North Lakhimpur & Jorhat. It may also be obatained online. But the forms and processes change often and are not updated as frequently as it may be required in the official sites.You may request the help of your friend staying in one of these places to help you obtain permit ahead of time. 3) Further information on permits can be obtained here and here. 4) BSNL Postpaid and Prepaid work sporadically. Private operators and most prepaid phone networks may not work in most places.